Writer of Westerns and supernatural chillers. Keen crafter. Constant super villain. Quite a lot of people were asking "What happens next?" so this story is a follow up to my flash last week, After It All. Far below a vast yet empty metropolis, beneath the rotting transport network, and the ruins of bygone eras, something moved in the dark. It growled, testing itself before it woke fully. The being was confused, having slept for centuries. With no humans left it had no thoughts to guide its form, so it settled on an amorphous mass, malleable and soft. It prodded at the world beyond itself, wondering why it had awoken. The being, a deity older than creation itself, noticed the silence first. Before it slept, it had lain in the depths, listening to the endless chatter from the world above. The being had withdrawn when it became convinced that man no longer cared for the state of his soul, and so it slumbered in the dark. Meanwhile, in the world above, humans turned their gaze from the cosmos to the incorporeal, their worship centered around glowing boxes they kept in their homes, or carried in their pockets. Their incessant talk and the buzz of information in the ether haunted the dreams of the sleeping being. It left the dark, and returned to the light. It expanded its mind, in all places at all times, and explored the world. Not a trace of life remained beyond that of the plants. Botanical life flourished where animal life had failed. The being quivered with a ghost of a smile. It wandered around the metropolis, where creeping vines and growing trees swallowed up the crumbling buildings. None of the trees were right, so the being explored further, and settled in a field far beyond the metropolis. It chose an ancient oak that stood apart from the rest of the forest, and imbued it with its first sentient thought. For the first time in four hundred years, the oak realised it missed humans. Beautiful follow to After It All. I really like this one. I like the ambiguity at the end: was it the oak that truly missed humans, or the blob deity giving that thought to the oak? In either case, I think the oak's next thought will be "I miss squirrels even more. Who will carry my acorns beyond the reach of my branches, and plant my children?" Seems like this could go on for a few thousand more words, to let the deity reach a revelation and conclusion. I like the somber tone, perfect for a cool autumn morning like this one. I have to wonder why the oak would miss humans, unless it's in recognition of our role in wiping out most of the oak's ecological competitors. If the creature imbued the oak with this thought, then I guess it must miss humans too. Powerful stuff. I shuddered and lumbered and woke with the being, seeing the world as it did. You captured it in gorgeous language. Well done, Icy. The more I read about new scientific discoveries about plants, the more I learn about how they have emotions and communicate. I really appreciated this one for that. All written content and photographic prompts are under copyright to Icy Sedgwick (or respective guest posters) and therefore can't be copied and posted elsewhere, unless you're quoting directly from posts and providing links to the original. Theft is theft, so let's all play nicely. 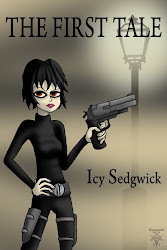 Icy Sedgwick was born in the North East of England, and is based in Newcastle. She has been writing for over ten years, and had her first book, a Western named The Guns of Retribution, published through Pulp Press in September 2011. She spends her non-writing time working on a PhD in Film Studies, knitting, baking and making jewellery. The search for a murderous outlaw has brought the long roving Grey O’Donnell near to his hometown of Retribution, Arizona. Bounty hunters ain’t popular but old fashioned manners, kindness to regular folk and a face for the ladies make Grey an exception round these parts; and a six gun’ll take care of the rest. Anyway, Grey has a job to do elsewhere. 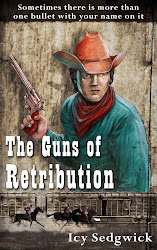 But, the odious Jasper Roberts has made himself Sheriff of Retribution and he has a score to settle with Grey. Jasper ain’t gonna let morals or the law get in the way of a good hanging and the townsfolk are cowed by their villainous lawman. Can you really mess with a man’s momma and get away with it? Sometimes there is more than one bullet with your name on it. Fifteen previously published stories, collected together for the first time, spanning fantasy, horror, sci fi and speculative fiction. Among other things, Bleed Them Dry puts a new spin on vampires, talking corpses tell their side in The Dead Do Listen, a little girl is fascinated with an antique that hides a dark side in The Mirror Phase, and a devilish game of chess goes wrong in Checkmate. A vaguely steampunk adventure, set in the fictional city of Vertigo. The Resistance is pitted against the shadowy Weimar Corporation that runs the City. Their stalemate is broken by the death of a suspected infiltrator, setting Resistance Commander Liss Hunt and her bewildered companion Philip Wiseman on a journey into the depths of both organisations to discover the truth behind who - or what - is really running the City. Featuring automatons, mad scientists, chases, a gun-toting heroine and even the Living Dead, The First Tale is a short novella that proves people are not always what they seem. I try to keep my fiction free, or at the very least incredibly cheap, but if you'd like to donate and help fund more writing in future, then you can! Write What You Know, But What If You Don't Know Enough? NaNoWriMo - Week 3 Already! © 2008 Links. Adapted to Blogger by Zona Cerebral, design by Arcsin Web Templates.